As with the PUMA, the EN-V leverages Segway&#8217;s dynamic stabilization technology to balance on two wheels. WARREN, MI – General Motors Co. advances the small electric concept vehicle it built with Segway Inc. and presented at last year’s New York auto show, unveiling today three updated models ahead of the World Expo 2010 Shanghai. Now called the Electric Networked-Vehicle, or EN-V, the 2-seat, dynamically stabilized machine looks much more plausible than the skeleton-frame Project PUMA that bowed before raised eyebrows on Manhattan’s west side in 2009. GM insiders confess they may have shown the PUMA, short for Personal Urban Mobility and Accessibility, too early and hope the EN-V can repair some bad publicity for a concept that, nonetheless, did what a concept should do – test the boundaries of traditional transportation. The auto maker, however, does not plan to show its EN-V concepts in New York next week, choosing instead a press event earlier today linked to China’s upcoming exposition. Chris Borroni-Bird, director-advanced technology vehicle concepts at GM, says Shanghai holds additional significance. As a vision of transportation in 2030, GM’s involvement in the event recalls the 1939 World Expo New York, where the auto maker displayed a vision for 1960 that anticipated the interstate highway system. As an emerging nation building some 20 new cities every month, China also represents one of the target markets for the EN-V, Borroni-Bird says. “This requires a clean-sheet city, in my opinion, to make it work,” he says, acknowledging production models of the concepts likely need dedicated lanes, or, he suggests, converted overhead railway platforms. “There are plenty of opportunities for a city to say, ‘We want to test this out on a very small scale,’ (and) maybe create a central business district that has this operational, Borroni-Bird says. “Most of us recognize that today’s solution is not practical for getting around big cities,” he adds, predicting multiple modes of transportation, including today’s internal-combustion vehicles, will populate roadways of the future. As with the PUMA, the EN-V leverages Segway’s dynamic stabilization technology to balance on two wheels. But whereas the PUMA required the driver to engage the balancing technology with the pull of a yolk, the EN-V automatically stabilizes itself. 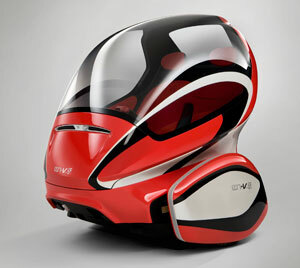 The EN-V concepts also use GM’s vehicle-to-vehicle technology that the PUMA only hinted toward. At a media backgrounder here last week ahead of the Shanghai debut, GM showed a video of the models performing a choreographed routine without drivers. Autonomous operation is a key intention of the EN-V, Borroni-Bird says, allowing passengers to safely work or interact with their vehicle while they commute. Connectivity between other EN-Vs and a city’s infrastructure also increases safety and opens up the potential for the units to conveniently valet themselves from a garage to the driver’s doorstep. Borroni-Bird says the EN-V could be considered a culmination of GM’s Autonomy and Hy-Wire concepts cars from earlier in the decade. The EN-V moves closer to reality many of their features, such as a “skateboard” chassis, drive-by-wire technology, fully-electric propulsion with motors at the wheel housings and autonomous operation. At the same time, Borroni-Bird admits much work remains, especially within the vehicle’s sensing technology. Its systems must be bulletproof to get to production. “We have to iron out a lot of bugs,” he says. However, Borroni-Bird says the table is set for the EN-V, as the world tries to curb pollution, ease congestion, free up parking and improve transportation safety in urban areas expected to house 60% of the world’s 8 billion people by 2030. A lithium-ion battery powers the EN-V some 25 miles (40 km) on a single charge, and recharging takes just four hours. With two wheels, it turns on a dime, reaches a top speed of 25 mph (40 km/h) and, measuring 5-ft. (1.5-m) long, would take up one-sixth the space of a normal midsize car. The EN-V also would represent a cheaper alternative to the traditional vehicle, from both ownership and operational standpoints. As rational a solution as the EN-V might be, it is equally emotive – a major shortcoming of Project PUMA. The three models debuting in Shanghai were penned at three different GM design centers, experiment with three different personalities and carry elements that may appear in GM vehicles arriving in the not-so-distant future. Xiao, or “Laugh,” was designed by GM Holden Ltd. in Australia under Antony Stalfo and ranks as the most-light-hearted of the three, with its “gumball blue” paint and nautical-inspired styling. Jiao, or “Pride,” comes from Mark Adams’ team in Europe, and its clean lines and bright paint work draw from bullet trains and Chinese opera masks. GM’s advanced-design studio under Frank Saucedo in North Hollywood, CA, penned Miao, or “Magic,” pulling from the consumer-electronics industry to convey a sleek, masculine look. The bodies and canopies of each EN-V employ strong, lightweight carbon fiber; custom-tinted Lexan plastic; and acrylic materials more often found on race cars, military airplanes and spacecraft. GM is studying all three materials for use on traditional automobiles, while the Alcantara leather of Jiao may turn up in a future Cadillac product. Designing the human-machine interface and lighting treatments of each vehicle also taught lessons GM will carry over to regular cars and trucks. Designed exclusively with computer software, 12 prototypes EN-Vs exist. The three finished models unveiled in Shanghai today stretch the functionality and durability of GM concepts, says Clay Dean, director-advanced design. “These must run for six months, whereas a typical GM concept would only run from the truck to the stage,” he says. The EN-V project proved as cathartic for the participating designers as it was educational, Dean says. “This was out of the box – take all your preconceived notions away. There was a reason we used our advanced studios to do it, because they live in a different space than our production studios. Borroni-Bird admits the EN-V may seem like a long shot but also reiterates its design, electrification and connectivity already are under development throughout the industry. Expo Shanghai 2010 anticipates more than 70 million visitors over its 5-month run, which begins May 1.